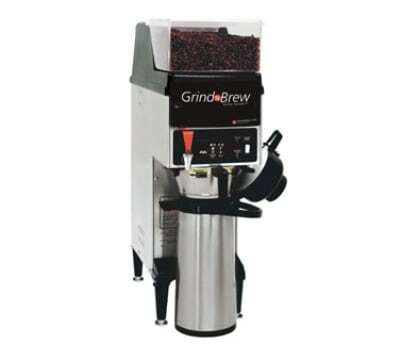 The Grindmaster-Cecilware GNB-10H single coffee grinder and brewer for airpot combines two machines into one to save counter space. Using PrecisionBrew™ technology, its three functions can be digitally controlled. Programmable pulse brewing enables as much as 20 percent of debris to be removed from a single coffee batch, and with its low-temp/no-brew feature, the brewing cycle will not begin until the water is at the ideal temperature. Throughout the brew cycle, temperatures remains consistent within 1 degree Fahrenheit. A bean usage counter on the user-friendly display tracks volume, but a brew volume can be set using a 'teach' mode when users are unsure of the exact amount. Settings on the Grindmaster GNB-10H single coffee grinder can be locked during the brew cycle to prevent tampering. Interested in coffee accessories to go with your coffee brewer? Check out our guide on commercial coffee accessories.